I have vocalized in the past that I am not a fan of Autism Speaks. They could be doing so much more for families or for finding out the cause of autism. They are really falling down on the job. This is not a post about Autism Speaks though. This is a post about a great place to find many things to do with autism. Some are awareness items and some are helpful items. 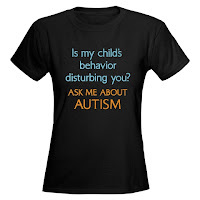 Autism Speaks comes in because a portion of their proceeds for the month of April will be donated to them. Cafepress’s intentions are good. There were several items that spoke to me. This one is such an awesome idea. This is a sticker that you could attach that to a window or a bumper or wherever on your car. 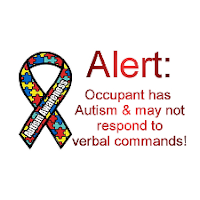 That way, if you are unable to speak for your child or if there is an accident then the emergency personnel will immediately know that your child has autism. Logan is verbal (hyper verbal if you can believe my luck. lol). But if we were in an accident or in a high stressed situation would he be able to verbalize appropriately? This would explain it immediately and for a measly $4. This t shirt is awesome in my opinion. It really speaks to me and conveys my feelings about Logan’s autism exactly. You don’t see wimpy people with autism. It is such a tough disorder. This shirt just makes it so empowering. It puts such a positive spin on it. All I can say to this one is wow! I love this shirt. Where was it when Logan wouldn’t let the sun shine on him through the car windows? I could have put this shirt to good use several years ago. Visit Cafe press to see their entire selection. 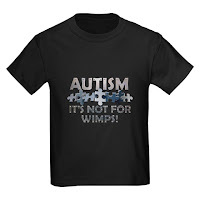 They have a ton of things for autism that could be helpful or just plain cute ( be sure to check out the rubber duck shirt). There are stickers, magnets, shirts, mugs, you name it. The other one I got is butterflies of all colors flying out of a box, and it reads, “Autism Living Outside of the Box”. Reece loves butterflies, and rainbows, and the day she was diagnosed she saw the specks of dust flying around the doctor’s office and said, “Butterflies” over and over again. She wouldn’t respond to anyone at all… just kept saying “butterflies”. So the shirt reminded me of her! The “I get flappy when I’m happy” shirt is soooo Pamela! I like the one that says, “Autism: see the potential” and the one aobut living outside the box. That is so me. Even in the autism world as an RDI, CM homeschooler, I’m out of the box . . .
Too funny! I love the stories! Thanks for sharing.